It’s thought the oldest part of this building may date from the 17th century. One of its former owners caused a stir when he left his estate to the wealthy Marquis of Bute instead of his own relatives. Pwllypant House was home to the Williams family from late 18th century or earlier. Bachelor William Evans Williams, who lived here in the mid-19th century, was a magistrate and owned a lot of land in the neighbourhood and in Newport and Breconshire. Industrialisation boosted his wealth, bringing new incomes including royalties from the Energlyn colliery and the Rhymney Railway. 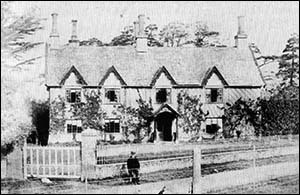 Outside Pwllypant House, he installed a “massive clock” which he probably bought at the Paris Exhibition of 1867. He died, aged 62, in February 1870, leaving all of his possessions to the Marquis of Bute. This baffled the press and public, because Mr Williams had had no personal connection to the marquis. He’d had some business dealings with the Bute Trustees, which had leased Pwllypant quarry in 1866 and used some of its stone for Cardiff’s Bute Dock and for one of Cardiff Castle’s towers. For his funeral at Eglwysilan, his tenant farmers were each given a silk scarf, a hat and a pair of gloves from a Cardiff draper. They were also treated to dinner at a Caerphilly hotel. The photo above right, courtesy of Caerphilly Local History Society, shows Pwllypant House around the time of Mr Williams’ death. The marquis rented Pwllypant House to John Stuart Corbett, son of the archdeacon of York and great-grandson of the third Earl of Bute. He had the building extended, to accommodate his family and his library. He was a keen historian and genealogist. His son, who had the same name, inherited the house and commuted by train from Llanbradach to Cardiff, where he was solicitor to the Bute Estate. He died at the house in 1921. The last member of the family to live here was Sybil Corbett-Williams, who died in 1957. The house became a home for disabled children in the early 1960s. Later it was a nightclub called Corbetts. It was the Cedar Tree pub until 2015, when it became the Toby Carvery.